First of all, this was taken on Main Street. MAIN STREET. Downtown. You know, like the heart of the city. It was taken on a Sunday afternoon, but still – it doesn’t look particularly vibrant or anything, does it? Next, if you don’t mind, spend just a little bit of time looking at the way the afternoon sun reflected off one building and put those bright leopardy spots on the other one. That’s pretty cool. But now: those two traffic cones, blocking off two not-in-high-demand parking spaces. Kudos to them for sticking with their job. No matter how silly it seems. Way to go, cones! 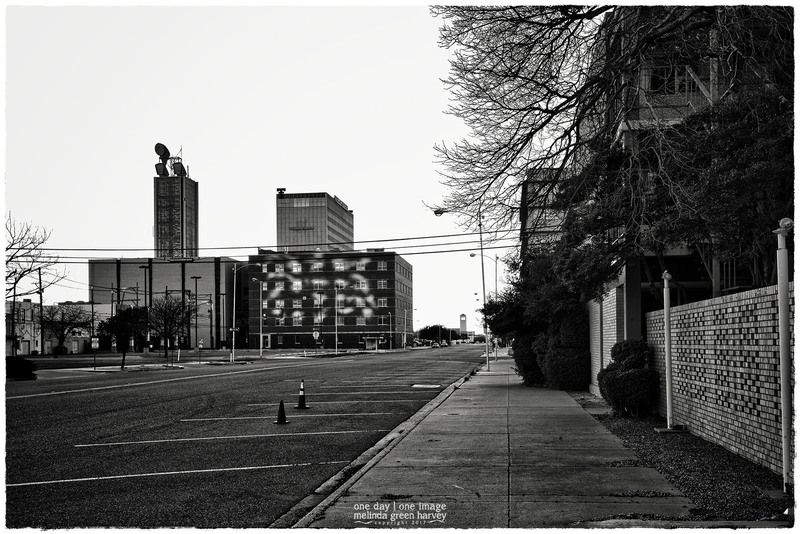 Posted on February 12, 2017, in Photography and tagged 365 photo project, architecture, black and white photography, downtown, lubbock, lubbock texas, melinda green harvey, monochrome, NIK Silver Efex Pro 2, one day one image, photo a day, photography, postaday, texas. Bookmark the permalink. 6 Comments. “They also serve who only stand and wait” perchance Milton strolled the streets of Lubbock? I hope the cones themselves were extremely vetted…. Cones will sneak up on you a friend says. We think they may be aliens! Ya done good MGH. That’s odd…because I was pretty sure those cones were three or four spaces further down the street when I got there. I decided my memory was faulty, but now…!